Is The 21 Foot Rule Really A Thing? 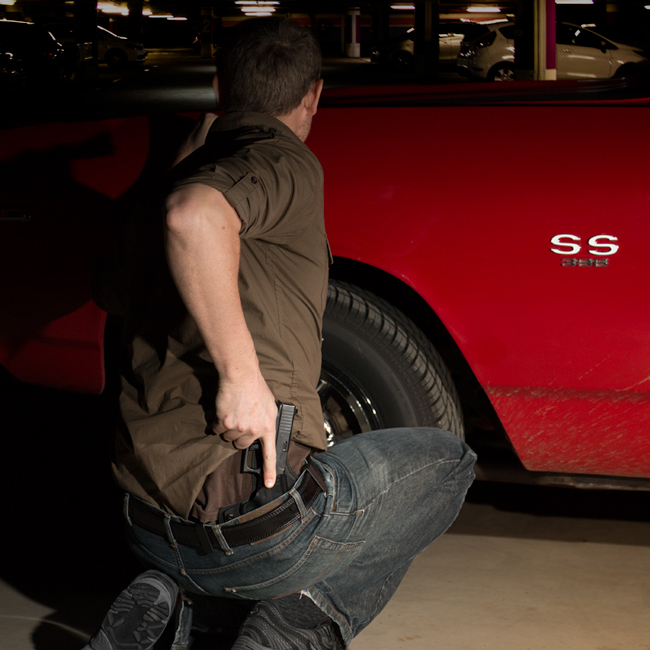 The 21 Foot Rule stems from the idea that by the time an officer or individual determines a deadly threat, draws his or her firearm and places two shots, an attacker has closed up to 21 feet between them, therefore reinforcing the idea that one should have their handgun drawn and ready to engage a target if they’re within that distance and approaching with a weapon, like a knife. 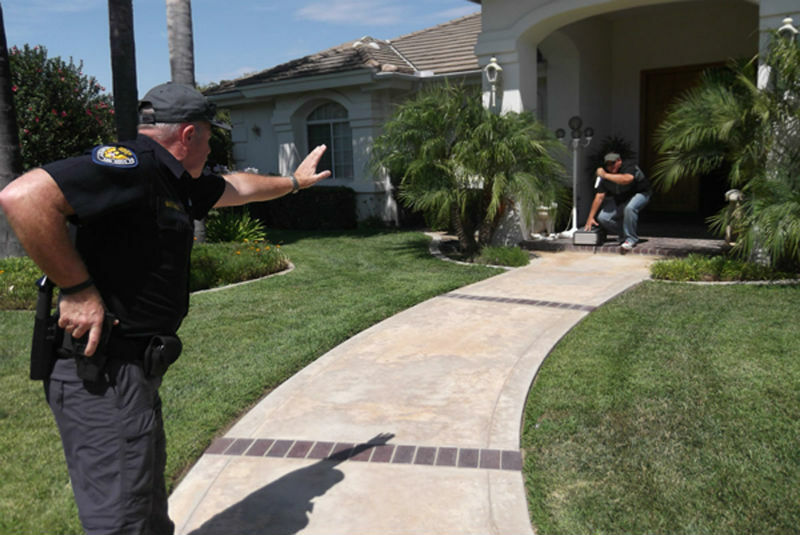 There is far too much ambiguity with the “21 foot rule” to consider it a rule at all, and the fact that it has been adopted as a “rule” within firearms practice and instruction is a far cry from its initial intention. Before addressing whether or not this idea, and the resulting Tueller Drill, is a legitimate preparation for self defense scenarios, its context and development needs to be considered. What is the Tueller Drill? The propagation of the Tueller Drill as an extension of that steadfast “rule” is a byproduct of a March 1983 article by Dennis Tueller, a now retired officer from the Salt Lake City Police Department, and it intended to analyze how proximity affects use of deadly force. Calibre Press referenced the article in their 1988 training video “Surviving Edged Weapons,” which further spread the ideas behind it. It was predicated on a basic scenario: an attacker with a knife or weapon like it (machete, bat or otherwise) ran 21 feet toward an armed victim within about 1.5 seconds. The reaction to this advancing threat was then briefly analyzed. The article was attempting to answer the question "How Close Is Too Close?" when an attacker is aggressively moving toward an armed individual. It also discussed where a “danger zone” is. The article has been preserved on the Police Policy Studies Council. It suggests a “tactical withdrawal,” or basically getting out of harm’s way and within cover, if possible, before considering placing shots as a means of legal self defense. It also suggests a verbal warning to potentially apprehend or disarm the attacker. If there’s no way to stop the threat without using lethal force, Tueller suggested then to take a long step back, which would add about three or four feet, and fire. The initial article pointed out that if the attacker is too far away then lethal force used in response will face even more legal scrutinization, too close and personal safety is at even greater risk. According to the article, the way to survive a scenario similar to this is to have proper mental conditioning, partially by having tactical or situational awareness, and to train with firearms to prepare for a threat like this. This can be done with a drill that improves how fast one can draw their holstered firearm and dispatch a threat. Consequently, the Tueller Drill, and its various interpretations, was established and circulated by multiple sources. The Tueller Drill trains an individual to recognize and react to an approaching threat crossing a set distance of 21 feet. Although there are specific variations, the drill can be conducted by placing about 21 feet (7 yards) between two people. One, the attacker, rapidly advances toward the other who has a holstered replica training gun, or a blue gun. This is an effective way of practicing how sidestepping can add space between the victim and attacker. Another way is to have the “victim” back-to-back with the simulated attacker at a firing range. The victim is facing the range with a target about 21 feet away. The attacker taps the victim on the shoulder and sprints in the opposite direction of the range. 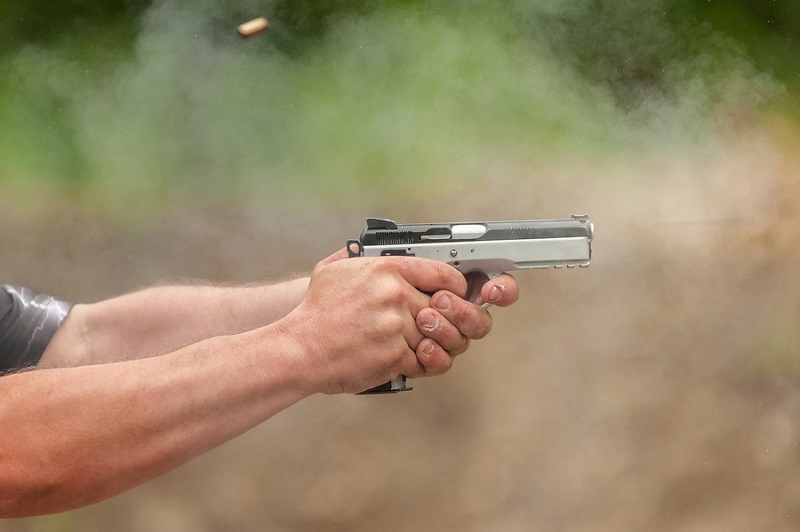 The victim shoots down range at a fake target and is only successful in the drill if the shot hits center mass and if the simulated attacker is within 21 feet behind the shooter. The simulated attacker drops their weapon upon hearing the first shot and tries to note where their foot stopped, measuring whether or not they advanced further than 21 feet. 21 Foot Rule And The "Reactionary Gap"
The 21 Foot Rule is entirely concerned with the "reactionary gap." This is the distance between the individual - the CCW-packing John Q. Public or police officer - and a potentially dangerous threat, wherein the individual may respond to sudden action. While having a conversation, a reactionary gap is often two arm lengths between the individuals. That said, “21 feet” can be construed as an arbitrarily prescribed distance used as a placeholder to speak on a larger scale about one’s “danger zone.” The 21 feet in this case might be the reactionary gap for the given scenario. It is not a steadfast rule and it seems most of the time people are lost in the specifics of disproving the minutiae of Tueller’s individual glimpse at the problem. Is it instead 25 feet? Is it 30 feet? The TV show MythBusters approached the matter as well, analyzing how throwing the knife over the space will affect the problem, and the rates of the attacker’s success by running varying distances. There are also factors like how fast the threat moves, how fast one might be able to retreat in response and whether or not retreating is possible, given fight or flight responses and adrenaline. Are there obstacles or is there cover to retreat behind? Will the attacker be able to close the distance before loss of blood or bodily damage impede their movement? That depends on shot placement. Is it legal to engage a knife-wielding attacker before they’re within reaching distance? 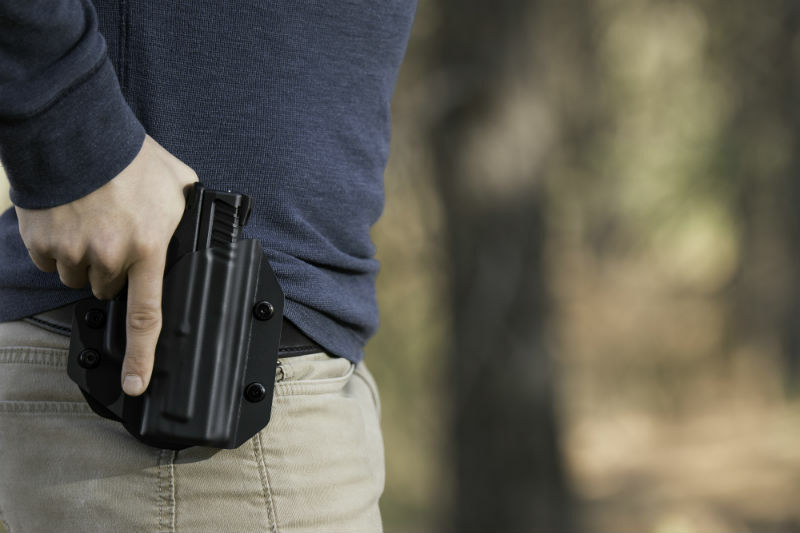 What level of retention does the potential victim’s holster have? How long will it take to draw a handgun from it? Once someone starts thinking about how to react to an approaching threat, they start to wonder why they don’t similarly move in response and engage the target on the move while attempting to put distance between them and the threat, which is a tactic some instructors use in training with the right approach. There are then arguments on how safe that is, both on firing ranges and in response to threats. Many use the 21 Foot Rule or Tueller Rule as what it should be, a guiding principle meant to reinforce how the space between a threat and a potential victim should be gauged and used as a form factor in an overarching reactionary formula. Several other elements then play into the appropriate reaction to an advancing threat. In structure, the 21 Foot Rule’s specificity is its undoing. It raises too many questions that cannot be concretely answered because there often won’t be set similarities in self-defense scenarios, whether it be location, weather, visibility, level of training, physical fitness, type of weapon carried by the attacker or any other criteria. So what does this mean about the Tueller Drill’s effectiveness in preparing one with a holstered weapon for a knife attack? The 21 Foot Rule is not a completely accurate way of describing every potential knife-wielding threat approaching the individual and the environmental conditions that may affect the engagement. However, the Tueller Drill can be a great way to improve judgment and reaction time when a threat is approaching. By using the drill to improve draw time and accurate shot placement, it can be one of many effective training drills a gun owner can run through. The idea behind the drill is also a useful principle to guide individual response to those approaching with a sharp weapon. It conditions one to think also about the efficacy of situational awareness as a means of using one’s environment beneficially as a source of cover they can retreat to in order to slow down the attacker. Incorporating lateral movement by maneuvering to the side can add just a few extra seconds to the threat’s total distance they have to cross. According to an instructor who wrote an article for The Truth About Guns, one the most important takeaways from the Tueller Drill in general is to understand how situational awareness can affect the total distance of one’s reactionary gap or danger zone.